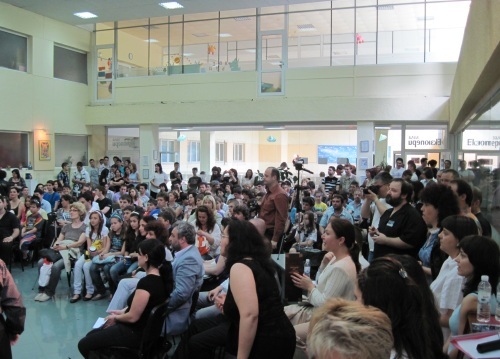 The final round of the Bulgarian IT Olympiad for school students was held on 29-30 May 2010 in Varna. I was invited to be part of the judge team in the category “Software Applications”. The reglament of the Olympiad says that students develop software at home and presents the results at the Olympiad. The most interesting and well done projects were a 3D-Studio like modeling engine, a coding and collaboration platform, universal remote control software and embedded device and platform for measuring motions and accelerations. Nice contest and nice students, very tallanted. One of the criteria for the judge was the quality of code of the source code of the presented software. Some people could be amazed but half of the projects were written really in “coding horror” style and had variables like TextBox4 and Button2_Click. To reduce this percentage I had a talk in “High-quality programming code”. Download the presentation here: High-Quality-Code-Presentation-Short.pptx. I had a talk about Telerik Academy and the free training for .NET software engineers that we do.